On Wednesday morning, Umang Patel was getting ready to drive to the Ravens Under Armour Performance Center. There, he would join five other Maryland Lottery finalists to find out who won the coveted “Seats for 20 Years” prize. But as any on-call doctor will tell you, plans can change in a heartbeat, which is exactly what happened that day. While the other finalists learned, that day, they had not won the big prize, Lottery officials kept the secret from Umang just a little longer. Lottery officials contacted Umang and told him he needed to come to Lottery headquarters to retrieve his prize pack from Wednesday’s event. Umang agreed to stop by, and the wheels were set in motion. 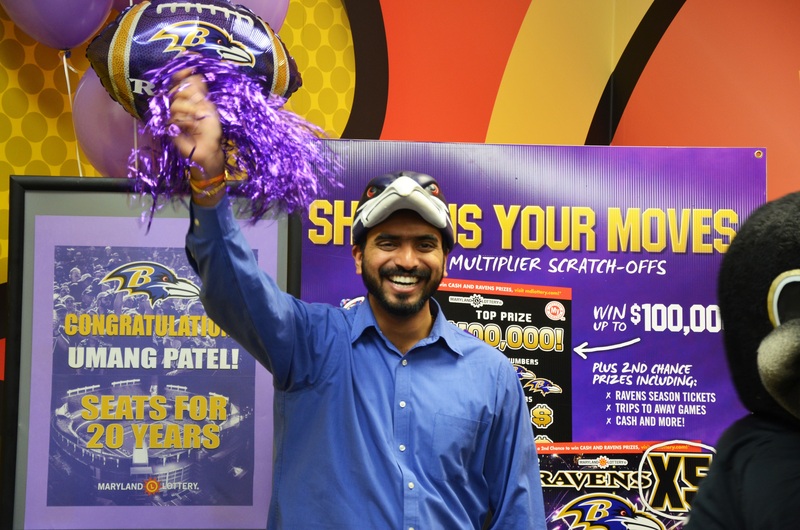 The unsuspecting winner walked into the Lottery’s “Winner’s Circle” to the sound of cheers as the purple-clad crowd, and Ravens mascot Poe, threw confetti and clapped loudly. Umang was stunned to see his name written across the oversized check as the winner of the “Seats for 20 Years” prize. “This is one of the greatest moments of my life,” Umang said with a wide grin.